Ri Yong Ho was appointed Foreign Minister of the Democratic People’s Republic of Korea (North Korea) according to a diplomatic note from the DPRK embassy in London to the government of the United Kingdom, dated May 16. Until now, Ri Yong Ho (not to be confused with the other Ri Yong Ho, a senior officer of the Korean People’s Army who was removed from all posts in 2012) has served as a vice minister in the Ministry of Foreign Affairs and as Pyongyang’s point man on nuclear negotiations such as the Six-Party Talks. Ri has at least 38 years of experience in foreign affairs and diplomacy. He majored in English as the Pyongyang University of Foreign Language. 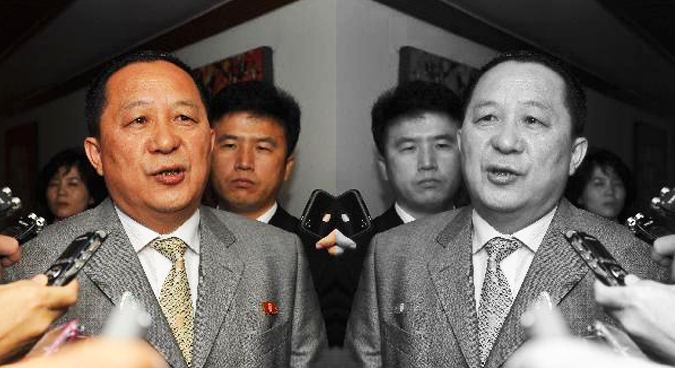 Afterward, he held numerous posts within the DPRK Foreign Ministry, first working as policy staff from 1978-79, then as a secretary at the embassies in Zimbabwe from 1979-85 and then Sweden from 1985-88, and then returning to North Korea to work in the Ministry’s Bureau of International Organizations from 1988-95. From 1995 to 2000 he held the title of councilor and then from 2000 was considered an ambassador-at-large. According to the recent diplomatic note, Ri has also previously served as DPRK ambassador to the United Kingdom. This is may have been from 2003 to 2007, when he is known to have been titled ambassador while serving abroad. From 2007, Ri held the title of “councilor and negotiator” and was promoted to vice minister of Foreign Affairs in 2010. That same year he was made an alternate member of the Workers’ Party of Korea Central Committee (WPK CC). In 2011, Ri was made chief representative to the Six-Party Talks, succeeding Kim Kye Gwan. He was recently made a full member of the WPK CC and an alternate member of the Political Bureau of the WPK CC at the conclusion of the Seventh Congress of the WPK on May 10. Ri also has much experience negotiating the North Korean nuclear issue and dealing with the United States and the other members of the Six-Party Talks (South Korea, China, Japan, and Russia). He participated in talks with the U.S. regarding Pyongyang’s nuclear program beginning in 1995 and even visited the U.S. in 2000 with First Vice Chairman of the National Defense Commission Jo Myong Rok. He has been considered one of the leading men in Pyongyang regarding nuclear talks and has met with counterparts from other countries, such as China’s Wu Dawei, numerous times. The elevation of a diplomat with so much experience on the nuclear issue and with the members of the Six-Party Talks (as well as the United Kingdom) may indicate a policy focus in Pyongyang. North Korea likely recognizes the nuclear issue and its relations with the U.S. as priorities in its foreign policy and consequently appointed the man with most relevant experience. The previous Foreign Minister was Ri Su Yong, who held the post since April 2014, succeeding Pak Ui Chun. Ri Su Yong was made a full member of the Political Bureau of the WPK CC, a vice chairman of the WPK CC and member of its Executive Policy Bureau at the Seventh Congress in May. This means that Ri Su Yong has not been demoted but is likely moving on to new roles within the North Korean leadership regime. Subscribe to read the remaining 551 words of this article.